Oil prices might recover later this year -- but things could also get a lot worse. Major oil-producing states failed to reach any agreement on freezing production at Sunday's long-hyped summit in Doha, Qatar. Perhaps surprisingly, oil investors took this news in stride. Crude oil prices plunged initially but ended Monday roughly flat following news that a massive strike had crippled production in Kuwait. Meanwhile, most oil stocks actually rose on Monday. Oil prices could remain depressed after producers failed to agree on a production freeze. Image source: The Motley Fool. This suggests that oil investors don't fully appreciate the risks following the failure of the Doha talks. In a worst-case scenario, the oil market might not rebalance until late 2017 or even 2018 -- leading to a lot more pain for oil companies ranging from industry titan ExxonMobil (NYSE:XOM) to shale pioneer Continental Resources (NYSE:CLR). After oil prices plummeted in late 2014, most oil industry pundits expected a relatively quick rebound, with low prices forcing relatively high-cost U.S. shale production out of the market. Nevertheless, U.S. output remained stubbornly high throughout 2015. However, U.S. production has finally started to decline steadily. As of early April, U.S. crude oil production was down about 400,000 barrels per day compared to a year earlier, according to the Energy Information Administration. Based on the decline in supply from the U.S. and other producers outside OPEC -- along with a projected 1.2 million barrel per day rise in demand -- the International Energy Agency has forecast that supply and demand will move back into balance during the second half of 2016. However, this forecast assumes that OPEC production holds roughly steady. Yet Iran hopes to boost production to at least 4 million barrels per day by early 2017, up from 3.2 million barrels per day in February. Meanwhile, after Iran refused to join other major oil producers in freezing production, Saudi Arabia threatened to raise production by another 1 million barrels per day. Of course, it's possible that Iran's production ramp-up will take longer than planned. There's also a decent chance that Saudi Arabia's threats to boost its own output are a bluff. And supply disruptions are a constant risk. But if Iran and Saudi Arabia both increase production without corresponding declines elsewhere in OPEC, the oil market will remain flooded for at least one more year. Notwithstanding the risk of another big increase in OPEC oil supply, Continental Resources CEO Harold Hamm predicted on Monday that oil would probably jump to $60 per barrel by the end of 2016. He stated that lower oil prices were unsustainable and that the market would probably rebalance by the summer. Yet oil billionaires like Hamm have consistently underestimated the threat from OPEC lately. Indeed, Hamm himself called OPEC a "toothless tiger" in late 2014 and cashed out all of Continental Resources' oil hedges back when oil still traded above $80 per barrel, anticipating a quick recovery. This foolish decision cost Continental Resources roughly $1 billion last year. If oil bulls like Hamm can be so cavalier with their own money on the line -- Hamm owns more than two-thirds of Continental Resources -- their empty prognostications deserve even more skepticism. In keeping with the general dismissive mood among oil investors, Continental Resources shares rose 4% on Monday, and have more than doubled from the multi-year low reached in late January. Meanwhile, shares of ExxonMobil are only 5% short of their 52-week high. 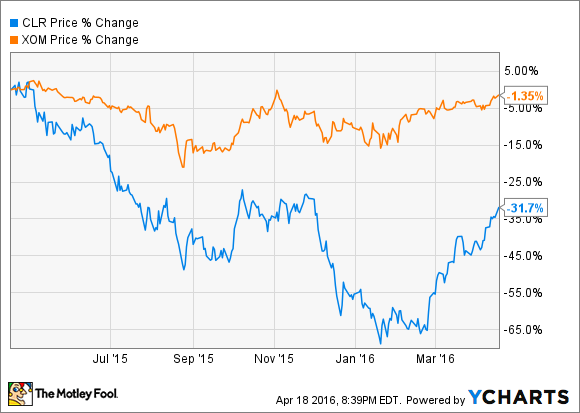 Continental Resources vs. ExxonMobil stock performance data by YCharts. These valuations reflect all of the potential for an oil price recovery later this year and none of the risk of a longer downturn. Continental Resources lost money in 2015, and oil prices are still nearly 20% below last year's average. Analysts currently don't expect the company to get back in the black until at least 2018. ExxonMobil fared a little better last year, with net income down "only" 50% year over year. However, ExxonMobil was helped by a multibillion-dollar increase in its downstream profits as refining margins surged. Like other oil producers, ExxonMobil will face further earnings pressure this year from oil price declines. But it will also have to contend with shrinking downstream profits, because refining margins are down significantly year over year around the globe. As a result, analysts currently expect earnings per share to sink another 39% in 2016. Investors are clearly betting on a quick bounce-back at oil companies including ExxonMobil and Continental Resources beginning later this year or in 2017. If a market share war between Iran and Saudi Arabia prevents the oil market from rebalancing until late 2017 or 2018, these companies will be in for a lot more pain. Investors shouldn't underestimate that risk.